Photo courtesy of the British Columbia Oral Cancer Prevention Program. Approximately 3,200 new cases of oral cancer will be diagnosed in Canada this year and many more cases will be diagnosed with dysplasia (pre-cancer), according to the British Columbia Cancer Research Centre. 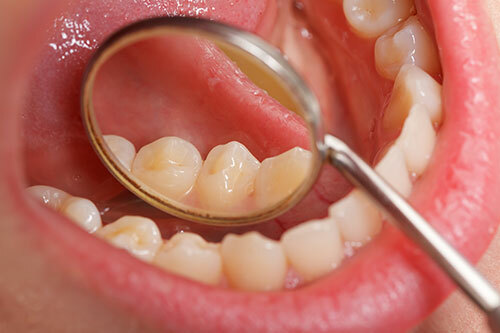 Approximately 84 percent of oral cancer cases may detected early by a dental professional. Screening for oral cancer is quick and easy, with no pain or discomfort involved. It's critical for early diagnosis and prevention. It takes less that five minutes, and can be done by your dental hygienist or dentist at your regular check-up appointment. Your dental hygienist will be looking for any lumps or abnormalities, red, white or grey areas and/or tenderness. 1. Physically examine and inspect the outside and inside of your gums and cheeks, extending all the way from top to bottom and front to back. 2. Examine and inspect the floor of your mouth underneath your tongue and the roof of your mouth. 3. Touch and inspect the lymph nodes in your neck and jaw, examine the inside and outside of your lips, your major salivary glands (cheeks and floor of mouth), as well as your jaw joint (TMJ) and the area around your ears. 4. Visually inspect your face for signs of asymmetry or swelling. 5. Pull out tongue with gauze and inspect posterior, sides, bottom and top. 7. Ask about your smoking and/or drinking habits, your lifestyle and any specific health conditions you have or medications you are taking which could affect the condition of your mouth or head and neck area.